First - there'sa Julia book I haven't read and of course now need to - how'd it get past me? More importantly - yes that salad. I cannot think of a better way to dress up winter fruits. Since fruit and I are best friends (I actually like a food group that is healthy), I will be doing this soon - and I am thinking again and again! The fruit looks gorgeous. What a lovely combination of colors! Briliiant! Sometimes, simple is the best! Thanks for recommending the book, I am sure it will be a good read. Happy New Year! Sometimes simple is the best answer. I can't wait to read that book...it is on my to-do list. Julia is such inspiration to me. I love a simple fruit salad, and I imagine the citrus adds such brightness to all of this cut fruit. Beautiful colors, wonderful flavors! Thank you for sharing this tasty salad with me. Sweet dreams, my friend! Simple is always better, than being overly elaborate. 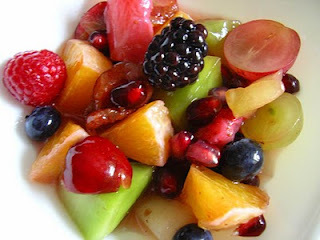 I don't make a habit of making fresh fruit salad in the winter, even though we live in S. Florida, but your fresh fruit salad, which is so colorful and refreshing, not to mention how pretty as well...inspires me to make some! I just left a comment, did not notice if it has to be approved before visible, so I'm leaving another one. Love the fresh and colorful fruit salad. It's always a welcome for any time of the day, or year! I also love how simplistic this is. This dressing lets the fruit be the fruit. The lemon and lime would give it just the right amount of crisp fresh flavor. Thanks for sharing! Beautiful, delicious fruit. Simply perfect!